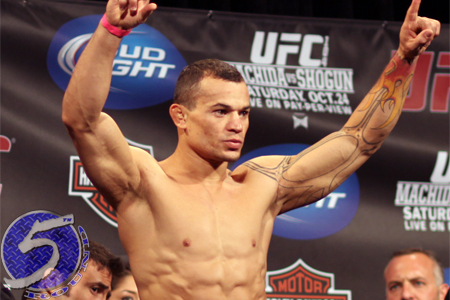 A lightweight affair between Gleison Tibau (pictured) and Pat Healy has been added to UFC Fight Night Atlantic City. UFC officials confirmed the tango Tuesday. Both athletes are looking to bounce back from disappointing performances. Tibau had his two-fight winning streak abruptly snapped when he was knocked out by Michael Johnson in December. Surprisingly, Healy finds himself in a must-win situation after looking dominant in his octagon debut just four bouts ago. The Strikeforce transfer steamrolled Jim Miller, but the submission win was overturned to a no contest after Healy flunked his post-fight drug test due to marijuana. “Bam Bam” has since been bad bad in dropping three straight decisions. The July 16 takes place inside Revel Casino Hotel in Atlantic City, New Jersey. Fox Sports 1 broadcasts the main card live.